In this political communication text, Richard M. Perloff examines the various ways in which messages are constructed and communicated from public officials and politicians through the mass media to the ultimate receivers-the people. With a focus on the history of political communication, he provides an overview of the most significant issues in the study of politics and the media. In addition to synthesizing facts and theories, and highlighting the scholarly contributions made to the understanding of political communication effects, Political Communication addresses such factors as the rhetorical accomplishments of American presidents, the ongoing tangles between the press and the presidency, and the historical roots of politics as it is practiced and studied today. It also addresses major issues about the press and politics that continually resurface, such as question of press bias and the use and manipulation of media by politicians to accomplish national goals. As a comprehensive and engaging introduction to contemporary political communication, this volume provides all readers with a historical perspective on American politics and press and offers a unique appreciation of the strengths and virtues of political communication in America. Contents: Part I:Mass Media and Government Institutions. Introduction to Political Communication. Early History of the Press and Presidency. Modern History of the Press and Presidency. Presidents and News in the Television Age. Covering the Presidency. Presidential Rhetoric. Presidential Rhetoric: Genres and Impact. Congress and the Media. The Media and Local Politics. Part II:Political Communication Theories and Effects. Political Communication Effects. Agenda-Setting. Agenda-Building. The Health Care Reform Campaign. Health Care Reform: News and Public Opinion. Part III:Communication and the Presidential Election. Presidential Campaigns: History and Overview. The Media and the Nominating Process. The Press and the Presidential Campaign. News Media Impact on Voters. Political Advertising: Content. Political Advertising: Effects. Debates: Formats and Strategies. Debates: Impact and Controversies. Epilogue. "Perloff's book is one of the few comprehensive analyses of this area, which is becoming an established subfield of political science." "...a masterful book examining political communication in America from the vantage points of social scientific and mass communication perspectives....The book is organized in a thoughtful and helpful way, incorporating historical and rhetorical perspectives as well. These vantage points are applied in varying ways throughout the book in such a skillful manner that it is hard to know where one ends and another begins. The book is written in a very lively and engaging manner and will likely find a wide audience." "This clearly written introductory text in political communication draws on the literatures of communication, rhetoric, and political science to provide an overview of mass media and government, the theories and effects of political communication, and communication in presidential elections. In three parts and 23 chapters, Perloff moves from the early history of the press and presidency, through such topics as covering the presidency and presidential rhetoric to Congress and the media..."
"Perloff's Political Communication provides an impressive overview of the broad range of issues that concern political communication scholars, teachers, and students. Its thorough examination of the role of communication in politics incorporates public and mediated communication, at national and local levels, and in the campaign and the governing process. This book will be an asset on every researcher's bookshelf and for every teacher and student in the classroom." "Political Communication is a must read for serious students of political communication....a superb political communication text....The reading of this book will no doubt result in lively classroom discussions. Students of political communication will benefit from this comprehensive and well-written text." "Richard Perloff has set a rich agenda for the students of political communication. 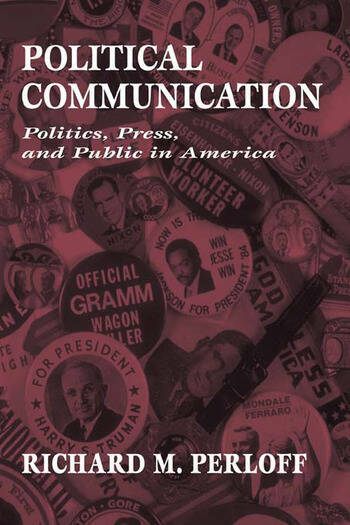 The chapters of Political Communication: Politics, Press, and Public in America, span the full scope of this area, everything from the rhetoric of presidents to the history of presidential engagement with the press, and the agenda-setting role of the mass media in the formation of public opinion. Other topics engaged by the multiple perspectives of this book are political debates, congress and the media, political marketing and advertising, the events and consequences of the presidential election year, and the classic foundations of political communication in the study of propaganda and elections. Although Political Communication parallels the accumulated research in its emphasis on the national political process, local politics is not ignored. This intriguing blend of material brought together by Perloff will interest students in journalism and mass communication, speech, and political science."